Hello friends! We’re so sorry we’ve been gone a while. Life clutched at us pretty tightly and we were left feeling distracted and disinterested in a lot of our favorite hobbies. We’re going to try and get back in the habit of posting things more regularly as both of us miss the site. We get asked to do spreads about people moving on a regular basis. Most recently I (Etienne) had a friend move from NYC to California for work. Sage and I did a reading for her and this was the form it took as a spur of the moment, intuitive reading that we did jointly. This tarot spread is adapted and influenced by more layouts than we likely remember, most notably a year ahead spread we’re prone to using. Feel free to use this spread, not only for a situation where you find yourself moving physically, but also moving onto new things; this could include a job, relationship, or other big life change. 1) You, in this moment. We suggest drawing this card, but if there is something that keeps coming up for you, you can also pick it and lay it in the center. 2/3) Leave this behind as you move forward, the energies are either leaving your life, or it’s time for them to leave. Oak and Sage Tarot on Facebook! Like our Header? 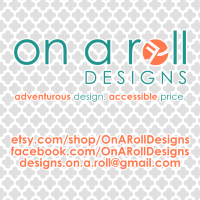 Check out On a Roll Designs!